In recent years, the government of Morocco, led by the young Western-educated King Mohammed VI, has unleashed what some regard as the most sweeping peaceful political and social reforms of this decade in the Arab world. Moroccan women, in particular, have achieved some important victories, playing an increasingly active role in politics, and successfully lobbying for a new family law which now grants them equal rights in marriage, divorce and the ownership of property. But Morocco, like countless Muslim nations across the globe, is teetering in a delicate balance between a reformist spirit and a resurgence of Islamic fundamentalism. What are the possible outcomes of the increased participation of women in Moroccan society? Women training to be Morocco’s first official female religious leaders at the Religious Scholars Council in Rabat, Morocco. Reprinted by permission of FOREIGN AFFAIRS, (May/June 2004). ©2004 by the Council on Foreign Relations, Inc.
Over the past decade, significant research has demonstrated what many have known for a long time: women are critical to economic development, active civil society, and good governance, especially in developing countries. Much like human rights a generation ago, women’s rights were long considered too controversial for mainstream foreign policy… Now, however, they [international development agencies] increasingly see women’s empowerment as critical to their mandate. The Asian Development Bank is promoting gender-sensitive judicial and police reforms in Pakistan, for example, and the World Bank supports training for female political candidates in Morocco. Women’s status has advanced in many countries: gender gaps in infant mortality rates, calorie consumption, school enrollment, literacy levels, access to health care, and political participation have narrowed steadily. And those changes have benefited society at large, improving living standards, increasing social entrepreneurship, and attracting foreign direct investment. Yet significant gender disparities continue to exist, and in some cases, to grow, in three regions: southern Asia, the Middle East, and sub-Saharan Africa… Deep tensions are evident in Saudi Arabia, Iraq, and Afghanistan, for example, and to a lesser extent in Nigeria, Pakistan, and Indonesia. Gender disparities hit women and girls the hardest, but ultimately all of society pays a price for them. Achieving gender equality is now deemed so critical to reducing poverty and improving governance that it has become a development objective in its own right. The 2000 UN Millennium Development Goals, the international community’s action plan to attack global poverty, lists gender equality as one of its eight targets and considers women’s empowerment essential to achieving all of them. Although there is no easy formula for reducing poverty, many argue that educating girls boosts development the most. Lawrence Summers, when he was chief economist at the World Bank, concluded that girls’ education may be the investment that yields the highest returns in the developing world. Educated women have fewer children; provide better nutrition, health, and education to their families; experience significantly lower child mortality; and generate more income than women with little or no schooling. Investing to educate them thus creates a virtuous cycle for their community. Educating women, especially young girls, yields higher returns than educating men… Better-educated women bear fewer children than lesser-educated women because they marry later and have fewer years of childbearing… Studies show that in India, educating girls helps lower birth rates even more effectively than family planning initiatives. Two students in class at the Religious Scholars Council in Rabat, Morocco, training to be Morocco’s first female religious leaders. World Bank studies indicate that, in areas where women have very little schooling, providing them with at least another year of primary education is a better way to raise farm yields than increasing access to land or fertilizer usage… Because women tend to cultivate different crops than their husbands do, they cannot rely on men for training and need their own access to relevant information. As land grows more scarce and fertilizers yield diminishing returns, the next revolution in agricultural productivity may well be driven by women’s education. It is no coincidence, then, that in the last half-century, the regions that have most successfully closed gender gaps in education have also achieved the most economically and socially: eastern Asia, southeastern Asia, and Latin America. Conversely, regions with lagging growth — southern Asia, the Middle East, and sub-Saharan Africa — have also lagged in their investments in girls’ education. Today, illiteracy among adult females is highest in southern Asia (55 percent), the Arab world (51 percent), and sub-Saharan Africa (45 percent). Studies of countries as varied as Bangladesh, Brazil, Canada, Ethiopia, and the United Kingdom suggest that women generally devote more of the household budget to education, health, and nutrition, and less to alcohol and cigarettes. For example, increases in female income improve child survival rates 20 times more than increases in male income, and children’s weight-height measures improve about eight times more. Likewise, female borrowing has a greater positive impact on school enrollment, child nutrition, and demand for health care than male borrowing. These differences help explain why extending microfinance (small-scale lending with little or no collateral) to women has become such a powerful force for development… Women now account for 80 percent of the world’s 70 million microborrowers. And studies show that women with microfinancing get more involved in family decision-making, are more mobile and more politically and legally aware, and participate more in public affairs than other women. 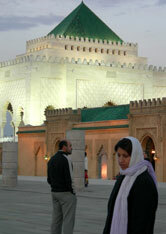 Mosque-goers at dusk in courtyard of the Mohammed V Mausoleum in Rabat, Morocco. But empowering women is rarely easy: it produces tensions everywhere, because it often collides with the twin powers of culture and religion. Today, much scrutiny is given to the impact of Islam on women, often as evidence of a deep cultural rift between the West and conservative Muslim societies. But the real cultural rift may be within the Muslim world: between highly traditional rural populations and their more modernized urban compatriots or between religious fundamentalists and more moderate interpreters of Islam. But now that the importance of women to economic and political development is becoming increasingly clear, several young, Western-educated reformist leaders — King Mohamed VI of Morocco, King Abdullah of Jordan, and Sheik Hamad of Qatar — are reclaiming control over these areas… Their efforts were boosted by the groundbreaking “Arab Human Development Report 2002,” which attributed the Arab world’s economic and political stagnation in part to gender inequality. Women in Morocco have made some remarkable advances in recent years. In the mid-1990s, with the support of the World Bank, Morocco launched a program promoting women’s participation in development by increasing girls’ education, health care for mothers and their children, and economic and political opportunities for women. It guaranteed that women would get 10 percent of the seats in the lower house of parliament in the 2002 elections. Women’s groups have also been encouraged to play a more active role in Moroccan politics. In recent years, they have lobbied hard to reform the moudawana, [Islamic-based family law] and despite vehement opposition from fundamentalists, Mohammed VI established a “royal consultative committee” to assist their efforts. In January, the Moroccan parliament enacted one of the most progressive women’s rights laws in the region, allowing women to marry without their father’s consent, initiate divorce, and share with their husbands responsibility over family matters. The minimum marriage age was raised from 15 to 18, and the practice of polygamy severely restricted. Similarly, in Jordan, King Abdullah is improving the education of women and increasing their participation in the work force and in politics. The government has eliminated any gender gap in primary school enrollment, and girls now outnumber boys in secondary and tertiary education. Queen Rania, Abdullah’s wife, has actively promoted microfinance initiatives, and under her patronage, in late 2003, Jordan hosted the region’s first microfinance conference. The government has also implemented limited electoral quotas, reserving six out of 110 seats in parliament for women. Nowhere, however, is women’s reform more startling than in tiny Qatar, an otherwise highly conservative Wahhabi state. Sheik Hamad has launched a number of political reforms, including the country’s first popular elections in 1999, in which both men and women were allowed to vote and run for office. Hamad and his wife, Sheika Mouza, have also encouraged educational reform. Women now make up nearly 70 percent of the country’s university students. Although Qatar’s population is less than a million, the effects of its reforms are likely to ripple beyond its borders. 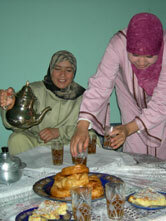 Houria Ben Kada and her mother, who appear in “Class of 2006,” prepare an afternoon snack of mint tea and cookies in the desert town of Bouarfa, Morocco. Saudi society is nearly completely segregated: in health care, education, and the work force. Women are treated as minors: they must have a male chaperon in public, they are not allowed to drive, and they need permission from their closest male relative to travel. The Saudi government has recently agreed to issue women identity cards, but only with the permission of a male guardian. The notorious mutaween (religious police) patrol malls to ensure that women are fully covered in public. In a tragic incident in Mecca in 2002, 15 schoolgirls were killed in a fire after mutaween allegedly forced them back inside the burning building because they were not appropriately covered. But the Mecca fire prompted a national debate over religious extremism, after which control over the education of Saudi girls was transferred from religious authorities to the Ministry of Education. And that controversy helped revive long-standing calls for change. Female literacy in Saudi Arabia has risen from 2 percent in the mid-1960s, when universal female education was introduced (over vehement protest from the religious authorities), to more than 70 percent today. Women now account for nearly 60 percent of all university students, and they increasingly question the constraints on their lives. In January 2003, Saudi women signed a petition demanding that the government recognize their legal and civil rights. Fundamentalists draw such a close link between women’s empowerment and Western decadence that reformists such as Crown Prince Abdullah must be exceedingly careful when they endorse the former not to appear to be condoning the latter. For now, the role of women continues to be a line in the sand between those who want to modernize the country and those who seek to impose a harsh, medieval version of Islam in the kingdom. Isobel Coleman is Senior Fellow for U.S. Foreign Policy for the Council on Foreign Relations, and irector of the Council’s U.S. Foreign Policy and Women program. Her forthcoming book QUIET REVOLUTION: WOMEN AND SOCIAL CHANGE IN THE MIDDLE EAST is due for publication in 2007. She recently coauthored Strategic Foreign Assistance: Civil Society in International Security (Hoover Institution Press, 2006).